Large-scale solar photovoltaic (PV) generation is projected to be cheaper than wind generation from around 2020. In a recent Conversation FactCheck I examined the question: “Is coal still cheaper than renewables as an energy source?” In that article, we assessed how things stand today. Now let’s look to the future. In Australia, 87% of our electricity generation comes from fossil fuels. That’s one of the highest levels of fossil fuel generation in the world. So we have important decisions to make about how we’ll generate energy as Australia’s fleet of coal-fired power stations reach the end of their operating lives, and as we move to decarbonise the economy to meet our climate goals following the Paris agreement. What will the cost of coal-fired and renewable energy be in the coming decades? Let’s look at the numbers. The chart below, produced by consulting firm Jacobs Group and published in the recent Finkel review of the National Electricity Market, shows the projected levelised cost of electricity (LCOE) for a range of technologies in 2020, 2030 and 2050. The chart shows a significant reduction in the cost of solar and wind, and a relatively static cost for mature technologies such as coal and gas. It also shows that large-scale solar photovoltaic (PV) generation, with a faster learning rate, is projected to be cheaper than wind generation from around 2020. Wind prices are already falling rapidly. For example: the graph above shows the 2020 price for wind at A$92 per megawatt-hour (MWh). But when the assumptions for the electricity modelling were finalised in February 2017, that price was already out of date. In its 2016 Next Generation Renewables Auction, the Australian Capital Territory government secured a fixed price for wind of A$73 per MWh over 20 years (or A$56 per MWh in constant dollars at 3% inflation). In May 2017, the Victorian renewable energy auction set a record low fixed price for wind of A$50-60 per MWh over 12 years (or A$43-51 per MWh in constant dollars at 3% inflation). This is below the AGL price for electricity from the Silverton wind farm of $65 per MWh fixed over five years. These long-term renewable contracts are similar to a LCOE, because they extend over a large fraction of the lifetime of the wind farm. 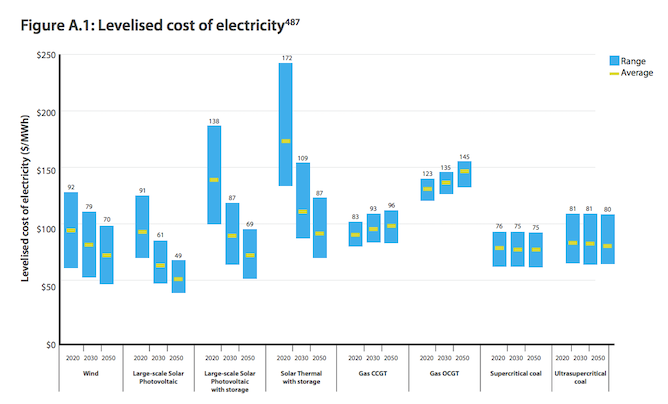 The tables and graph below show a selection of renewable energy long-term contract prices across Australia in recent years, and illustrate a gradual decline in wind energy auction results (in constant 2016 dollars), consistent with improvements in technology and economies of scale. But this analysis is still based on LCOE comparisons – or what it would cost to use these technologies for a simple “plug and play” replacement of an old generator. Now let’s price in the cost of changes needed to the entire electricity network to support the use of renewables, and to price in other factors, such as climate change. The economic, environmental and social costs of greenhouse gas emissions are not included in simple electricity cost calculations, such as the LCOE analysis above. Neither are the costs of other factors, such as the health effects of air particle pollution, or deaths arising from coal mining. The risk of the possible introduction of carbon emissions mitigation policies can be indirectly factored into the LCOE of coal-fired power through higher rates for the weighted average cost of capital (in other words, higher interest rates for loans). The Jacobs report to the Finkel Review estimates that the weighted average cost of capital for coal will be 15%, compared with 7% for renewables. The cost of greenhouse gas emissions can be incorporated more directly into energy prices by putting a price on carbon. Many economists maintain that carbon pricing is the most cost-effective way to reduce global carbon emissions. One megawatt-hour of coal-fired electricity creates approximately one tonne of carbon dioxide. So even a conservative carbon price of around A$20 per tonne would increase the levelised cost of coal generation by around A$20 per MWh, putting it at almost A$100 per MWh in 2020. According to the Jacobs analysis, this would make both wind and large-scale photovoltaics – at A$92 and A$91 per MWh, respectively – cheaper than any fossil fuel source from the year 2020. It’s worth noting here the ultimate inevitability of a price signal on carbon, even if Australia continues to resist the idea of implementing a simple carbon price. Other policies currently under consideration, including some form of a clean energy target, would put similar upward price pressure on coal relative to renewables, while the global move towards carbon pricing will eventually see Australia follow suit or risk imposts on its carbon-exposed exports. Renewable energy (excluding hydro power) accounted for around 6% of Australia’s energy supply in the 2015-16 financial year. Once renewable energy exceeds say, 50%, of Australia’s total energy supply, the LCOE for renewables should be used with caution. This is because most renewable energy – like that generated by wind and solar – is intermittent, and needs to be “balanced” (or backed up) in order to be reliable. This requires investment in energy storage. We also need more transmission lines within the electricity grid to ensure ready access to renewable energy and storage in different regions, which increases transmission costs. And, there are additional engineering requirements, like building “inertia” into the electricity system to maintain voltage and frequency stability. 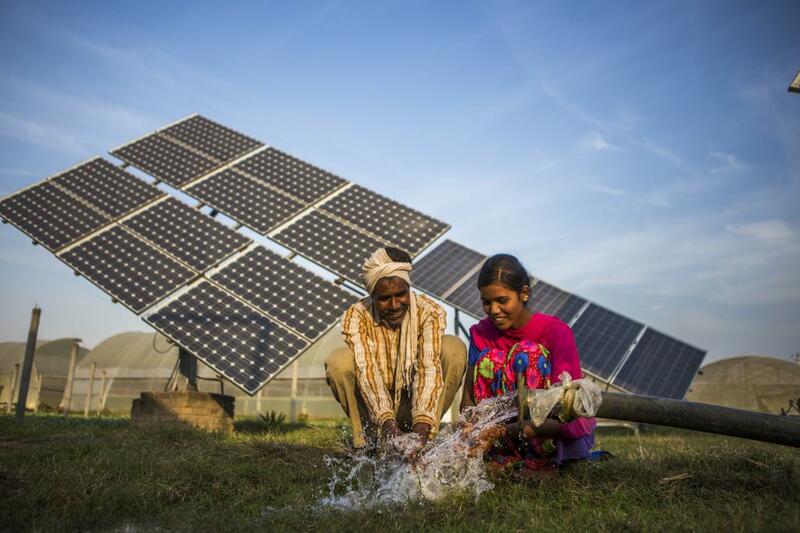 Each additional requirement increases the cost of electricity beyond the levelised cost. But by how much? Australian National University researchers calculated that the addition of pumped-hydro storage and extra network construction would add a levelised cost of balancing of A$25-30 per MWh to the levelised cost of renewable electricity. The researchers predicted that eventually a future 100% renewable energy system would have a levelised cost of generation in current dollars of around A$50 per MWh, to which adding the levelised cost of balancing would yield a network-adjusted LCOE of around A$75-80 per MWh. The Australian National University result is similar to the Jacobs 2050 LCOE prediction for large-scale solar photovoltaic plus pumped hydro of around A$69 per MWh, which doesn’t include extra network costs. The AEMO 100% Renewables Study indicated that this would add another A$6-10 per MWh, yielding a comparable total in the range A$75-79 per MWh. This would make a 100% renewables system competitive with new-build supercritical (ultrasupercritical) coal, which, according to the Jacobs calculations in the chart above, would come in at around A$75(80) per MWh between 2020 and 2050. This projection for supercritical coal is consistent with other studies by the CO2CRC in 2015 (A$80 per MWh) and used by CSIRO in 2017 (A$65-80 per MWh).